Hevel Maon Enterprises (YAHAM), established in 1956, is a cooperative of 10 Kibbutzim (Communal Farms) in the southwest region of Israel – the Negev. The cooperative farms 4,000 hectares of prime irrigated land and 400 hectares of citrus orchards. Production is year round and we are amongst the largest exporters in Israel of fresh agricultural produce to the European market. We permanently employ 200 people, but take on 350 more workers during the high season. Large state of the art automated packing facilities, each dedicated to one specific crop, ensure the high quality that we are known for. Our regional climate and mostly sandy and loess soil are perfect for growing the produce that we expertise in. Farming in the region is an advanced, intensive and sophisticated operation. Hevel Maon's financial turnover for 2017 exceeded $100,000,000. Potatoes, which are the main crop in the Western Negev, make up about three quarters of the volume of Hevel Maon's overall activity. Approximately one third of our potato production is exported to markets in Europe with the majority of the produce being sold to England, Germany, the Netherlands, France, Norway and Switzerland .The rest of the exported produce is marketed to Eastern Europe and Russia. 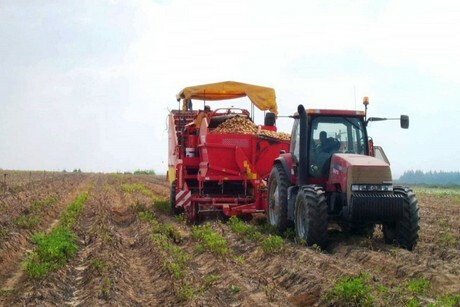 We also harvest 12,000 tons of potatoes for the processing industries in Israel. Israeli consumers are not as potato-savvy as their European counterparts and are not sufficiently particular about the potato variety they are eating. Hevel Maon Enterprises, understanding the potential of marketing commodities with higher quality and standards, created in 2002 the brand name "Uncle Moses". All "Uncle Moses" products are graded and sized by sophisticated, computerized optical machines, and undergo severe quality control. Potatoes come in different color consumer packages, according to recommended usage – baking, cooking and frying. We recently introduced a new "Gourmet " package containing varieties that used to be known only to the European consumers. "Uncle Moses" is trying to increase Israelis' potato awareness by being the only brand which specifies the variety on each bag. The "Uncle Moses" brand name is known not only for its potatoes but for its carrots, baby radishes and onions as well.